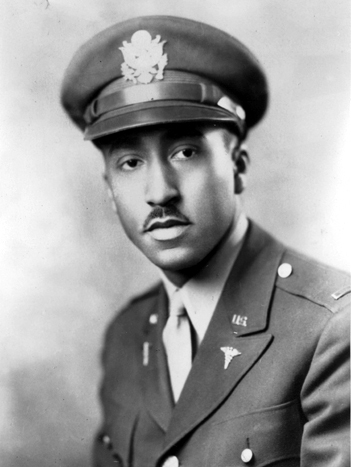 John L. S. Holloman, Jr.
John L. S. Holloman, Jr., was a physician, a medical administrator, and a civil rights activist. He earned an M.D. from the University of Michigan Medical School in 1943 and later took advanced medical courses at Cornell University’s School of Medicine. In Dr. Holloman’s extensive teaching and public health career, he served as a professor of public health and health administration at the University of North Carolina at Chapel Hill, as a consultant to the U.S. Department of Health and Human Services, and on the staff of the Subcommittee on Health of the House Committee on Ways and Means of the U.S. Congress. In the 1960s, he served as an attending physician on many of the civil rights marches in the South, including the 1965 Selma march, for which he also planned and managed medical services. As a founder of the Medical Committee for Civil Rights, he led a protest against the American Medical Association’s support of medical organizations that would not treat black patients. Dr. Holloman’s other posts included the presidency of the New York City Health and Hospital Corporation and of the National Medical Association as well as the national chairmanship of the Medical Committee for Human Rights. Dr. Holloman was the medical director of the W. F. Ryan Community Health Center in New York City.